Travelling with music is in the news. Next week On An Overgrown Path takes off by plane to Languedoc for a few bars rest. We are travelling light so I am experimenting with the XMI X-mini II speaker for use with my iPod nano, see the photo above. Initial results have been very impressive. 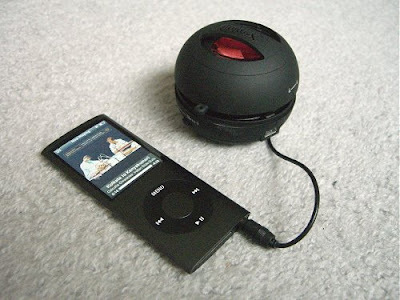 The mini speaker weighs just 400 gramms, plays for eleven hours using an internal battery charged via the supplied USB lead, gives very acceptable sound aided by the vacuum behind the miniature drive unit and costs just £12.99 delivered. Of course it does not compare with full-sized speakers. But the XMI X-mini II does exactly what it says on the packet and is a very sociable supplement to the trusty Sennheiser PX 200 headphones I travel with. We are flying to Perpignan with Ryanair. I have used this airline many times because they fly from London Stansted, which is our nearest major airport. No, they do not win prizes for courtesy, but nor do they claim to. But last December I returned from Marseilles to Stansted with Ryanair for just 14 euros including all taxes and the flight arrived early. With Ryanair, as with the XMI X-mini II speaker, you get what it says on the packet. Which means I strongly advise anyone using Ryanair to read very carefully what it says on the packet, particularly about cabin baggage. And don't believe anything anyone tells you on the phone. There are always two sides to a story. Many people who have had different experiences have become friends of a Facebook page called Musicians Against Ryanair and I hope the airline takes notice of their complaints. I have not trawled through the 12,928 musicians currently "against Ryanair" on Facebook. But I cannot help wondering if any of them are among the many who are, "off the record", also against what is happening at BBC Radio 3. If so, would they put their name on a Facebook page called Musicians againt BBC Radio 3? 14 Euros to fly from Marseilles? Great value, until we start taking into account the cost to the environment! What does the "packet" have to say about this? Sorry Bob, but I strongly believe that cheap air fares are not to be encouraged. TMH, absolutely the right sentiment. Air travel is one of my personal bugbears, along with car ownership! However, I know we all have our own reasons as to where, why and how we travel, and how often. But, and it's a big but, I very strongly feel that a realistic price, including the environmental impact, needs to be placed on such travel. On a relevant tangent, this year's Gulf oil spill have been horrendous. So has the reaction to BP (not that I am apologising for them, I hasten to add) of millions of US citizens who fail to see or accept the link between BP and their own insatiable desire for cheap "gas". Aplogies if I sound holier than thou! Composer (and webmaster of New Music reBlog) Jeff Harrington has left Florida because of the BP oil spill and is moving to Avignon in France. I was offered during a professional trade show the same speaker (with the logo of the sponsor). They are really very good indeed.